Want your own copy to print out and put on the fridge? Click HERE! The 60s and 70s were sometimes called the "decade of discontent" because of the demonstrations against the war and the race riots in Detroit, Los Angeles, and other cities. Then again they were called the decade of "peace, love, and harmony". The music of this period reflected these feelings, and some of the most powerful music ever heard was written. As music diversified at the end of the 70s with the emergence of punk, hip hop, and electronic music, new sounds took over the airwaves, infusing themselves into rock, metal and top 40. From sea to sea to sea, Canada is a music powerhouse. From legends like Prairie Oyster and Anne Murray, to 90s star like Shania Twain and Paul Brandt, to modern heroes like Corb Lund and Jason Aldean, you’ll hear all your CANCON country faves, plus plenty of new stars rising up from the underground. A rock playlist containing the all-times top names in Canadian rock, including some that you probably didn’t even realize were Canadian. When it’s forty below and too cold to go outside, what are you going to do? Keep it rockin’ indoors, that’s what! Ease yourself into the day with a selection of classical compositions. Everything from Beethoven to Debussy; a sure hit for anyone with a refined taste in music. 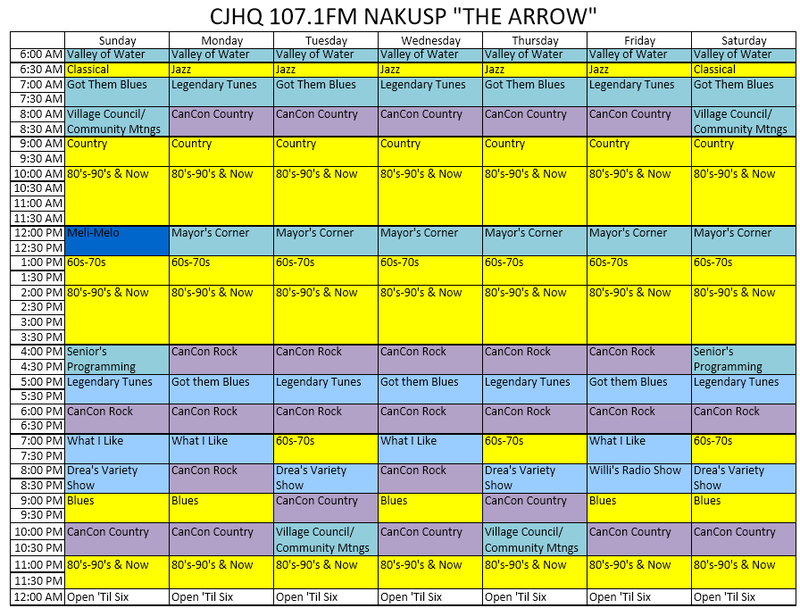 The Arrow has seventy years of country music at your fingertips every day. Whether they’re old Nashville classics, outlaw legends, CMT favourites, bluegrass wizards, alt-country idols, or fresh off the farms, we’ve got ‘em here. Drea's Variety Show is an hour-long compilation of song and spoken word on a weekly theme. Got Them Blues gives us a listen back to the music that started it all. A classic blues show presented by our local DJ Bunty Maxfield, giving us a chance to hear that classical blues vinyl. Kick off your morning with the sounds that started it all. All the legends are here, and so is the new breed. There isn’t a station in the interior that can match the blues selection of the Arrow. Each weekday morning begins with the best selection of jazz going. Everything from soul to swing to instrumental favourites can be found here. Phil McMechan brings you some of the most interesting and inspiring artists of all time every Tuesday and Friday with 60 minutes of blues, jazz, roots and folk from the 1940’s to 2011. A 100% organic and fairly hosted French spoken word show. Hosted by Prudence-Elise Breton and Lyne Chartier, and produced in Nelson for 93.5 FM. Nakusp Mayor Karen Hamling interviews someone in the Village connected to current events/. Anything goes. You never know what will show up overnight. Things get weird after dark... Some adult language. Normally comprised of a recording of Nakusp's Bi-Monthly Village Council Meetings, this time slot can also be pre-empted by other noteworthy Community Meetings. Brought to you by your host Chris Ewings, the show title is self expanatory. Some adult language.